This floriferous mass is about two feet in diameter less than one year after planting only two three inch pots. Coconut Thyme does not smell or taste like coconut, but it sure blooms well and grows fast. 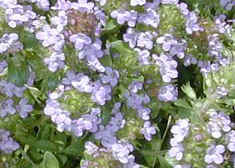 It is nice planted in swaths in front of Caraway Thyme because both are heavy bloomers but bloom at different times. Make sure to give Caraway Thyme a lot of room or it will over come the Coconut Thyme. Coconut blooms here in July. 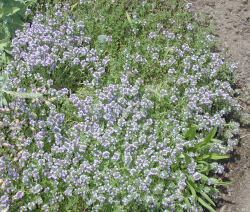 One of the fatter blossoms in the creeping thyme group, Coconut Thyme grows quickly and is covered with the flower heads for about four weeks in summer. Coconut Thyme may be included in our 36 Pack Alternative Lawn Assortments. This plant is often available in plug trays. These trays hold 128 of all the same plant. They are a great low cost way to fill a lot of space. Each cell is 3/4 of inch by an inch. Check here to see if Coconut Thyme Plug Trays are available.